The Pinnacle Ridge storm outfall is located along the north shore of Sturgeon River, just east of Starky Road. Drainage from the Pinnacle Ridge subdivision is collected by storm sewers and conveyed to this storm outfall, constructed in 2004. 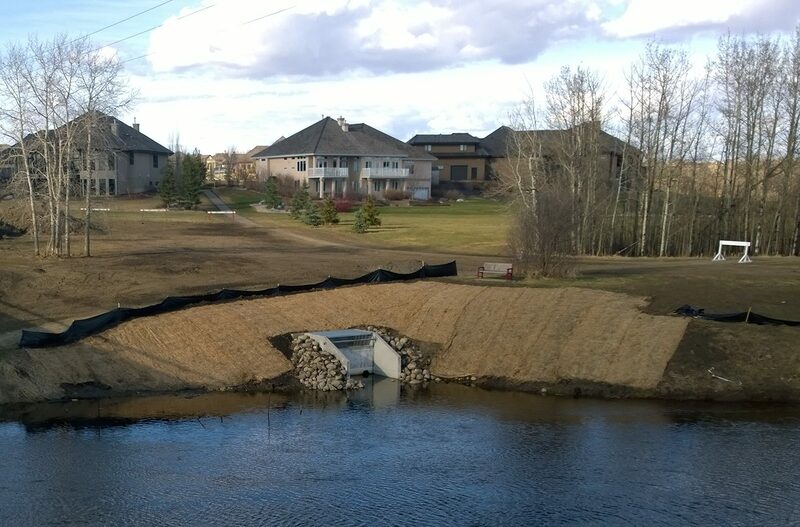 The existing outfall was freezing in winter causing surface flooding in the subdivision especially during spring runoff events. Sameng was retained by the County in September 2013 to assess the problem and implement a long-term improvement solution. Conducted a hydraulic assessment of the Sturgeon River winter flows and water levels using Water Survey of Canada gauges data. This information was used to estimate historical ice surface elevation of the River using statistical analysis, and to establish an elevation for the new outfall. We determined that the existing outfall was constructed below the normal ice surface elevation of the River such that pipe freezing was a significant concern. Sameng also identified erosion issues downstream of the outfall. After developing options and evaluating their cost-benefit, we recommended that the existing outfall be removed and a new outfall constructed at a higher elevation. This outfall would provide a 100-year level of service. This option was carried on to detailed design and construction. Sameng was involved in obtaining all regulatory approvals: Water Act, DLO, DFO, Navigable Waters, TFA. These approvals were prepared and obtained rapidly as the design was completed in January 2014 and construction was to start in March 2014. We prepared tender documents and provided contractor procurement services. We provided construction supervision and contract/construction management. The now constructed improvements include the installation of a 1050mm concrete pipe for a distance of about 54m. This new pipe follows the existing pipe alignment to the River at a milder slope. Near the River, the pipe deviates from its alignment towards a new outfall structure. 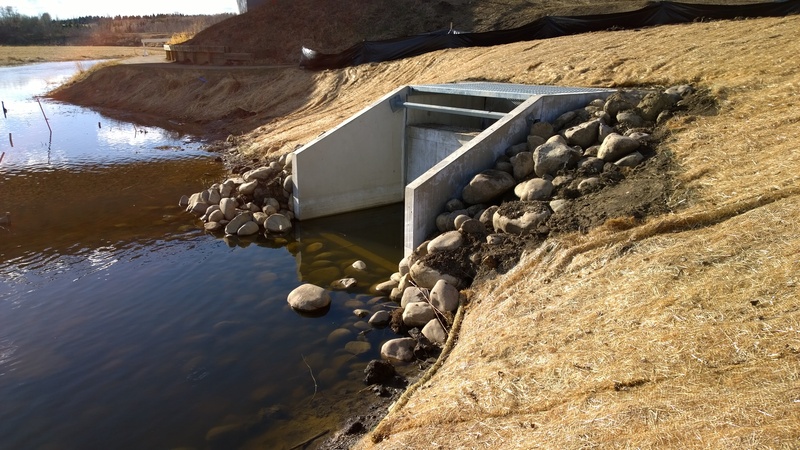 The new outfall was designed as an USRB Type VI Impact Chamber to reduce velocities and prevent erosion downstream of the outfall. Rip-rap and an erosion control blanket were also installed for erosion protection of the structure and the River.